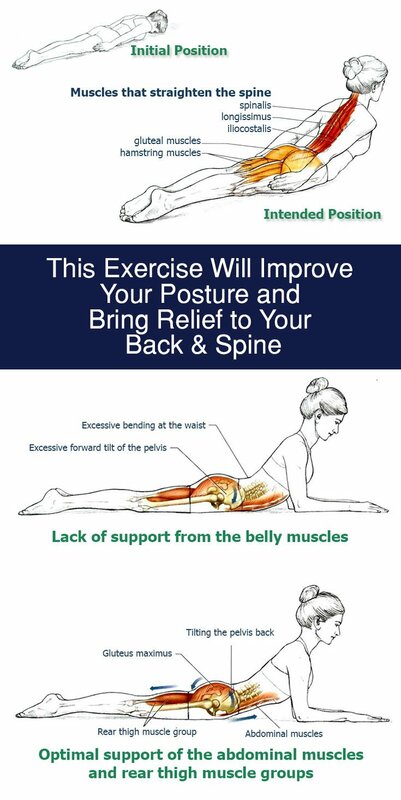 The Back Extension Stretch is a widely used exercise to strengthen the muscles on your back, protect your spine from injury and relieve back pain. Physiotherapists apply this exercise not only in sports training, but also in medicine. Our lower and upper back stretches will help you increase the flexibility of your back muscles, help you develop a perfect posture and bring relief to your back. If you work in an office, or tend to sit a lot, you can use Back Extension Stretch to alleviate health issues associated with prolonged sitting. By starting from the 1st exercise and working your way to the more demanding ones, you are making a gradual progression and protect yourself from injuries. Feel free to take several weeks with one exercise (when working out 2-3 times per week) before you advance to the follow-up exercise. Think of these exercises as stretches and don’t push yourself too hard: stretch in a controlled manner and stay focused at all times. A certain amount of discomfort is perfectly normal, but don’t wait for it to grow into pain (you want to relieve back pain, not cause it). Enjoy! Inhale: slowly lower the trunk and head to the initial position. Repeat the exercise 10 times. By straining the muscles of the abdomen and pulling them up, we tilt the pelvis back into position. 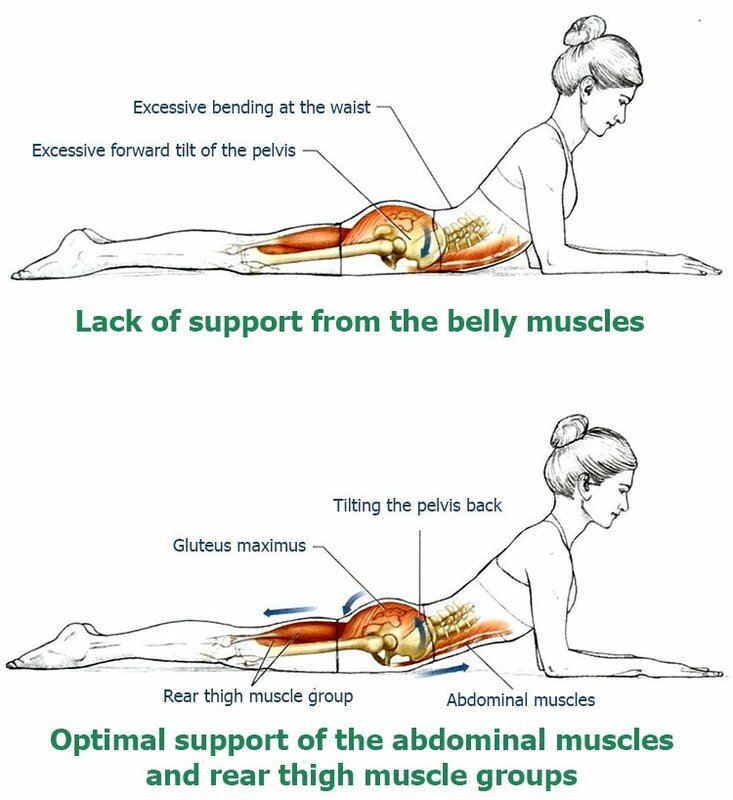 Make sure to firmly press the pelvis to the mat and pull your stomach and abdominal muscles to direct the effort toward your chest, as shown on the illustration just above. This will not allow the pelvis to tilt forward and it will remove unnecessary tension in the lumbar region. 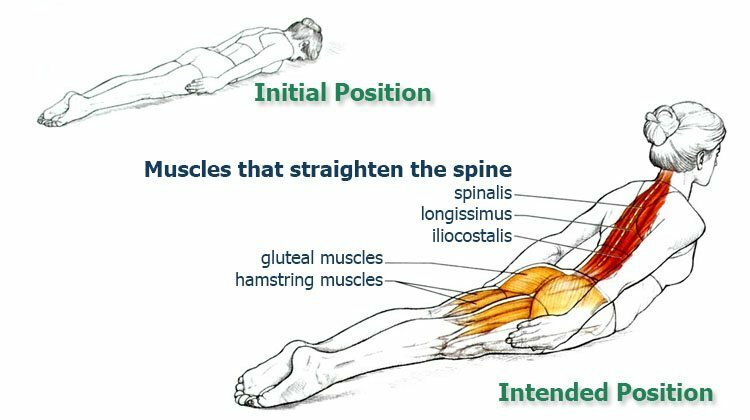 The ability to use your abdominal muscles to stabilize the lumbar region is necessary to optimally perform this and more complex lower and upper back stretches. This newfound flexibility will increase your core mobility, help you to a perfect posture and relieve discomfort in the back. The next part of the program is this back stretch.